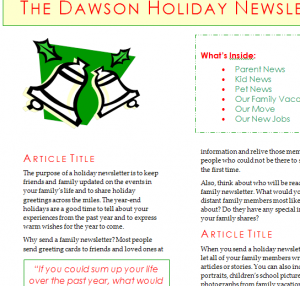 Change up your routine this holiday season by making your own Holiday Newsletter Sheet. Nothing makes the holidays more special or personal than making your own newsletter to share with your family and friends. The purpose of this template is to give you a media in which to keep everyone you love up-to-date with the latest events that you’ll be hosting on the holidays. Everything from food to the festivities will be highlighted this year for all to see! Now you have the opportunity to share your holiday greetings across the country with everyone you know. Start by downloading the free file located at the bottom of your screen by clicking on the link provided. The Holiday Newsletter is designed to be a simple and straightforward way to send your family and friends a little holiday spirit. Start with the “What’s Inside” box located in the top-right corner of the page. This is where you will list an overview of what will be included in your newsletter. If you want to make a section where you talk about the dinner for your holiday meal, simply title one of the columns as such and list it in this box. When you are ready to start typing your actual articles, begin on the left-hand side of the first page and write about the first topic you listed in the “What’s Inside” box. Follow the list throughout the entire article, until every topic has a corresponding article. You can even personalize the document by right-clicking on any of the images provided and selecting the “Change Picture” option from the drop down menu. This way, you can insert family photos or anything else from your computer. There are also green boxes throughout the template where you can put funny or informational quotes from your articles! At the very bottom of the page, there is a convenient box listing mailing information so you can easily print the document and send it out. Just fill out the recipient’s address and print it! Create your own Holiday Newsletter and brighten up the season!